Pipe tomahawk with a metal head that could serve as both a weapon and as a ceremonial smoking pipe. The wooden handle has a hollow core that could be used as a pipe stem for smoking. The handle has been wrapped with a panel of loom-woven glass beadwork, and a piece of decorative fringed satin cloth ribbon has been attached to the end. The blade has three small holes drilled through it. Read more about customs and rituals - enter 'customs' in the search box to your left. You'll need some tobacco for your pipe. Check the Beaver Index - e.g., The Peace Pipe, by Dr. John MacLean, March 1925. Pipe tomahawks were introduced into the fur trade by Europeans at least by 1700. Although many were functional, they were generally used for ceremonial purposes. This example is decorated with delicate glass beadwork and would have been used for only special occasions. 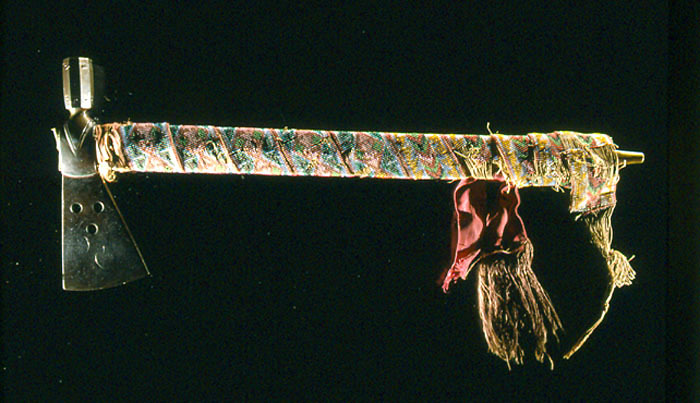 The beadwork on the pipe tomahawk was produced on a loom by an Aboriginal woman. Traditionally, pipe stems were decorated with carvings, porcupine quill work, or horsehair. The pipe tomahawk is a good example of how a pair of objects was brought together to create a new invention – in this instance, a tomahawk and a pipe. Both objects were highly valued by Aboriginal traders. The origins of this unique item are unknown although it is believed that it was developed by a blacksmith from England. In Aboriginal society, the pipe tomahawk was highly symbolic and represented the dual aspect of relationships between their communities and Europeans – war and peace. It was a popular trade item, and many were presented as gifts to Aboriginal leaders as a sign of good will during the negotiation of trading relationships and alliances. More ornate examples became symbols of the prestige and status of their owners.